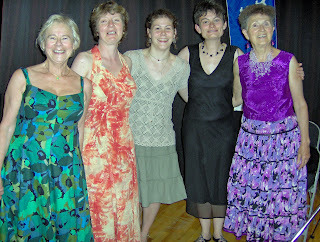 Welcome to our blogg for Scottish Country dancing. We are based in Jersey, Channel Islands and we can be contacted by e-mail or phone 01534 484375 for further details. Scottish Ball in traditional dress code. Our dance group is affiliated to the R.S.C.D.S and we have two qualified dancing instructors. We hold our club practice every Thursday at Trinity Primary School from 7.30 p.m.to 10.00 p.m. with a tea/coffee break half way through the evening. We extend a welecome to visitors to the Island who love Scottish dancing and would also invite any local or newly established residents who are familiar with Scottish Dancing to join our group. We hold an annual Ball over the Bank Holiday at the end of May. We also travel to other groups in Guernsey, Eastbourne, Weymouth, Montpellier and Perros in Brittany when they too hold their annual events. So why not join in the fun.